Are you looking for an orthodontist in Plant City, Florida who offers comprehensive orthodontic care to your whole family? If so, your search is over. At Orthodontic Specialists of Florida, located at 1205 Baker Street West in Plant City, Dr. Dennis Buchman is happy to help you achieve the beautiful smile of your dreams. We provide quality orthodontic care for all of Plant City as well as Walden Lake, Walden Woods and surrounding communities. At Orthodontic Specialists of Florida, our orthodontics won’t just help you enhance the way you look. They will also help patients of all ages experience improved oral health. The specialized care provided by orthodontics is typically associated with a healthy, bright smile. However, the ultimate purpose of orthodontic services is to ensure the health of patients’ gums and teeth. Crooked or misaligned teeth often leave an abundance of spaces for bacteria and food particles to become stuck. Furthermore, when significant gaps exist between teeth, the gums are left vulnerable to plaque and germs. Orthodontic services can even help make it easier for patients to speak clearly and chew food properly. In most cases, traditional metal braces are the best option for children and play a critical role in pediatric dental care for kids. These devices, made from stainless steel, are attached to teeth using brackets. Individuals with crooked teeth often have trouble eating and chewing. Orthodontic treatment can help prevent tooth decay by improving patients’ overall oral hygiene. Using braces to straighten crooked teeth can ensure a more beautiful smile in the long-term as well as increased self-confidence. Dr. Dennis Buchman has been helping his patients achieve their orthodontic goals and enhance their oral health since 1979. He graduated from the University of Florida College of Dentistry where he obtained his Doctorate degree in Medical Dentistry. Dr. Buchman finished his training in orthodontics at West Virginia University before opening his own practice. 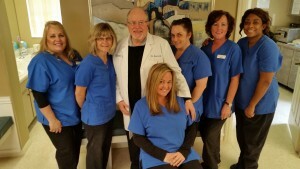 Besides working closely with his patients, Dr. Buchman has also served as both a board member and Executive Vice President of Orthodontic Centers of America. When you come to our practice in Plant City, Florida, you will receive a warm, friendly welcome from our professional staff who will ensure that you and your family feel right at home while also offering you with the highest standard of orthodontic treatment. We spare no expense in providing you with a relaxed, calming environment and an all-around experience that is sure to make you happy. We always welcome new patients to our office. If you are looking for a Plant City orthodontist, we urge you to give us a call today to schedule your free consultation. If you’re unsure whether orthodontic care is necessary, we also provide second opinions free of charge. At Orthodontic Specialists of Florida, we look forward to developing a relationship with you, providing superb orthodontic care to your whole family and serving all of your orthodontic needs. Call or drop by today to meet our Plant City orthodontic specialists today!